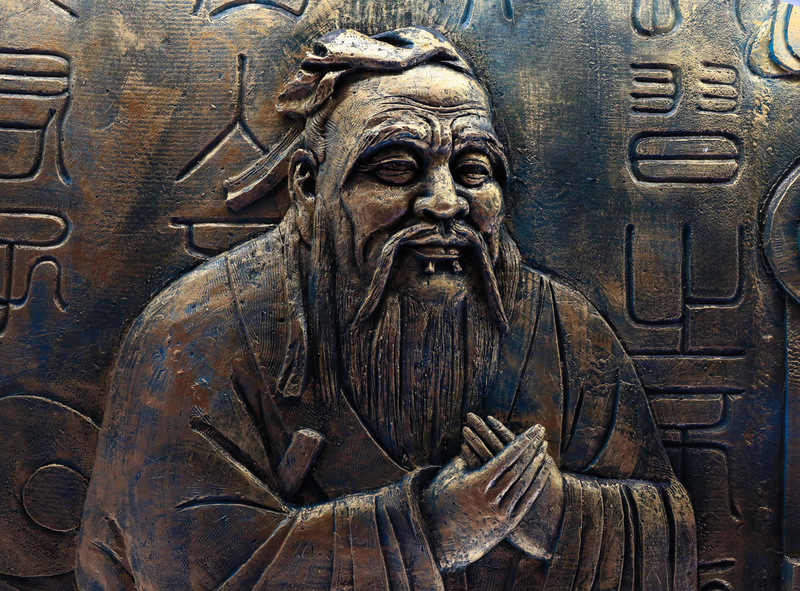 A bronze relief of Confucius in Beijing, July 9, 2018. New Mexico State University established a Confucius Institute (CI) in 2007, of which I was the founding Director on the American side until 2015. This was part of an ongoing relationship between my university and a college in Shijiazhuang, Hebei, which included a student exchange program that had hosted American students since 2001. Over the past 12 years, the CI has brought teachers to New Mexico and West Texas. These teachers have taught at New Mexico State University and at the University of Texas in El Paso, and have worked with high schools and primary schools in the region. This has allowed thousands of students to have at least an initial encounter with Chinese language and culture, and at the university level has allowed students to pursue Chinese language study more thoroughly. The CI has also organized public programs, including a speakers series, and two academic conferences, one on the U.S.-Mexico-China relationship, and one on China in Africa. These conferences brought together scholars and officials from the United States, China, Mexico, Tanzania, Zambia, and Kenya to talk about complex issues of economics and politics. In both conferences, and occasionally in the speakers series, there have been presentations critical of Chinese government policies and practices. At no time has the Chinese side made any effort to interfere in the content of these programs, or of the Chinese language classes. I can’t speak for the experience of CIs at other universities. But in New Mexico, a poor state with limited resources allocated for public education, the CI has been a valuable asset in helping prepare young people for life in a complex and competitive 21st century world. We have been able to offer a few advanced students scholarships to study in China, one of whom has gone on to pursue doctoral studies in Chinese History at Oxford. From the beginning, our staff has been committed to rejecting any Chinese government involvement attempting to shape the content of our program. Such interference would have resulted in the immediate termination of our agreement with Hanban. This has never been an issue. Some institutions may have self-censored about issues which they believed would be problematic for the Chinese side. I think this is a misjudgment on the part of those schools. It is critical for Americans to have a better awareness and knowledge of China as we move deeper into the 21st century. Confucius Institutes can be a vital resource for communities such as mine, and can operate successfully without deference to real or imagined political sensibilities. The Confucius Institutes (CI) are a major tool of Chinese soft power, as they promote a certain view of Chinese society abroad. But academic rigorousness can limit CIs’ influence. Since its opening in 2010, the University of New Hampshire (UNH) CI has developed a symbiotic relationship with the UNH Asian Studies program—the two have worked together to increase student interest in China. The university in turn has hired more highly qualified Asian faculty, who offer a wide variety of comprehensive courses on Chinese geography, history, literature, media, philosophy, and politics. This symbiotic relationship will continue, as long as the UNH-CI does not interfere with academic freedoms. I co-established the Asian Studies minor at the University of New Hampshire in the mid-1990s to promote Asian studies in this New England university that had traditionally focused resources on Anglo-Saxon studies. Unfortunately, Chinese language courses were taught sporadically by a variety of lecturers of various abilities. The problem was financing. In the “Live Free or Die” state, the New Hampshire legislature contributes less than 10 percent of total university system revenue, providing the smallest contribution per student of any state. Some priorities thus had to “die,” including Asian languages. In October 2008, Chengdu University invited UNH to establish a CI. I submitted a preliminary report on the global CI initiative, based on a random global survey from 20 schools based in the United States, Europe, and Asia. As our university lacked a language program, our primary goal was to guarantee Chinese language instruction and establish study abroad opportunities. The UNH China Committee originally proposed establishing a rigorous Executive Advisory Board, which the administration eventually replaced with a pro forma Confucius Institute Board. Two co-directors—from Chengdu University, and a UNH Chinese lecturer—actually oversaw CI activities. During the next five years, the CI provided the university with excellent Chinese language instructors, expanded Chinese language programs within the university system and local high schools, established a study abroad program, initiated training sessions for Chinese academic deans, sponsored various cultural activities, and managed a summer language program for children. The CI also financed all-expense-paid trips for key university administrators and some faculty members to visit Chinese cities. Yet, this looser form of supervision became a major issue in the five-year review process, which coincided with Professor Marshall Sahlins’ publication of his 2014 book on “academic malware.” The university administration subsequently tightened its supervisory role and hired a new tenure-track professor in Chinese literature and languages, who took full responsibility for overseeing the CI’s language teaching faculty. In addition, the Communications, Geography, and Political Science departments added tenure-track lines in Asian Studies. We now could prepare our students for the 21st century. Of course, the problem of China’s soft power can be easily remedied. To replace Chinese money, the U.S. Department of Education should expand its funding of East Asian National Resource Centers to finance critical language and interdisciplinary programs in less prestigious universities. But again, the problem is money . . . and foresight. Confucius Institutes (CIs) undermine academic freedom and suppress discussion of human rights at college campuses and affiliated venues. They are a platform for the Chinese government to disseminate political propaganda that paints a misleading picture of China and core “sensitive” issues like Tibet and Taiwan, but under a veneer of academic credibility provided by the host institution. This was the case at the University of Maryland, when its Confucius Institute hosted a series of events in 2009 glossing over China’s colonial policies in its western regions: At the opening of an April 2009 photo exhibition on Tibet, then Deputy Chief of the Chinese Embassy Xie Feng disputed claims of repression against Tibetans and criticized the Dalai Lama. Despite the oft-made comparison to Germany’s Goethe-Institut or France’s Alliance Française, CIs are different: They are embedded in our university campuses while being ultimately answerable to the Chinese government. Beijing chooses and trains the teachers, and expects them to provide pro-Chinese Communist Party (C.C.P.) versions of Chinese history and society. Their evasion, suppression, and distortion of a host of topics Beijing does not like is well documented. And while universities often claim they have full oversight of their CIs, it is difficult for administrators who don’t understand Chinese to vet curriculum or monitor program staff. At Tufts University, administrators were unaware their CI’s director and staff were trying to establish a Confucius Classroom at a local elementary school—an activity the university had not sanctioned, nor that was allowed under the visa terms of the Chinese staff. Considering all we know about CIs, it is remarkable they are allowed to operate at American schools. Funds for Chinese language studies may be sparse, but that does not make it okay to partner with an authoritarian government that subverts academic freedom and human rights. The price of hosting CIs is too high. Shut them down. Confucius Institutes in the United States have gotten a bad rap for the wrong reasons. In recent reports, testimonies, and speeches by American politicians, Confucius Institutes (CIs) have been lumped together with nefarious behavior such as intellectual property theft, espionage, and intimidation of Chinese students and scholars on U.S. campuses. In fact, the main problem with CIs is structural. They do not fit well into U.S. universities, which value faculty governance and academic freedom that permits multiple views and perspectives. CIs by design facilitate a one-sided, biased view of China—the one that the Chinese Communist Party in Beijing wants to project. This is achieved through the strict control that Hanban, a unit of the Ministry of Education, maintains over budgeting. Hanban in Beijing approves programming and events. Faculty may play a role in proposing events, but they do not have the final say. Hanban’s line-item control over CI budgeting far exceeds the influence of other types of government-funded programming that one might experience on an American university campus. For example, many area studies centers that received U.S. Department of Education (DOE) funding via Title VI, as designated National Resource Centers, do programming and events using those funds. I like to joke that as a director of one of these centers, I could host an event tomorrow with the title, “Why the Trump Administration’s China Policy is the Worst Ever.” We would then report the event as part of programming, provide documentation of how the funds were spent, and tally the number of attendees. I would not require DOE approval nor would I get post-event criticism from the DOE, even though it is led by a Trump appointee. The second mechanism is related to the first: the natural and necessary adjustment in faculty decision-making to avoid topics that are unlikely to be approved. Certain topics will be avoided entirely. Cultural genocide of Uigurs? Showing of movies that have been banned in China? A panel on the new constraints on media and popular culture? This self-censorship is the most insidious consequence of CIs’ presence on U.S. college campuses, as it represents our own acquiescence to political control over academic content. What is the result? It depends. On college campuses with constrained budgets and scarce funding or attention to Chinese language training and Chinese studies, CI-approved content will be the only game in town. Over the long run, CIs will be able to set the agenda on how China is taught, what content is permissible, and what content will be left out. On college campuses with established programs, programming will shift. The CI will do programming that is “friendly to China,” while China Centers and other faculty-governed units will take over the content that is “unfriendly to China.” Programming on China becomes bifurcated between different units, with China Centers unfairly bearing the burden of academic freedom, with its emphasis on diversity and the inclusion of difficult and fraught topics.